Learn to initiate the integration of your clients’ spirituality as an effective practical intervention. A client’s spiritual and religious beliefs can be an effective springboard for productive therapy. How can a therapist sensitively prepare for the task? The Therapist’s Notebook for Integrating Spirituality in Counseling is the first volume of a comprehensive two-volume resource that provides practical interventions from a wide range of backgrounds and theoretical perspectives. This volume helps prepare clinicians to undertake and initiate the integration of spirituality in therapy with clients and provides easy-to-follow examples. The book provides a helpful starting point to address a broad range of topics and problems. 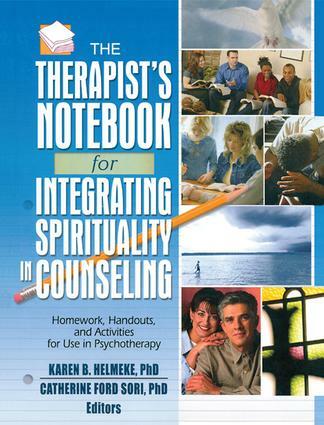 The chapters of The Therapist’s Notebook for Integrating Spirituality in Counseling are grouped into five sections: Therapist Preparation and Professional Development; Assessment of Spirituality; Integrating Spirituality in Couples Therapy; Specific Techniques and/or Topics Used in Integrating Spirituality; and Use of Scripture, Prayer, and Other Spiritual Practices. Designed to be clinician-friendly, each chapter also includes sections on resources where counselors can learn more about the topic or technique used in the chapter—as well as suggested books, articles, chapters, videos, and Web sites to recommend to clients. Each chapter utilizes similar formatting to remain clear and easy-to-follow that includes objectives, rationale for use, instructions, brief vignette, suggestions for follow-up, contraindications, references, professional readings and resources, and bibliotherapy sources for the client. The Therapist’s Notebook for Integrating Spirituality in Counseling is a stimulating, creative resource appropriate for any clinician or counselor, from novices to experienced mental health professionals. This first volume is perfect for pastoral counselors, clergy, social workers, marriage and family therapists, counselors, psychologists, Christian counselors, educators who teach professional issues, ethics, counseling, and multicultural issues, and students. Embracing Emotional Pain As a Means of Spiritual Growth: Tools from the East. Priester, Integrating the Discernment of Spiritual Guidance in Family and Couples Therapy: Use of the Examen. Index. Reference Notes Included.